Mister Glum shoots the unsuspecting SuperPatriot in the back but is left frustrated with his weapon when his intended victim starts to stir. He destroys the gun before rummaging through the wreckage for anything that could be of use. Glum starts to construct a device that will enable him to transport all of the salvaged technology and weapons before he retrieves the God Gun. He then notices the chemistry equipment he used to transform Angel and starts to feel bad. The giant Angel looks through a window into the hospital room where her mother is being treated, asking Dragon about Jennifer’s condition. The doctor confirms that Jennifer has a broken back and left leg and could well be paralyzed by her injuries. They will not know for sure until Jennifer awakens and can tell them the extent of the paralysis. Angel suddenly vanishes from sight, shrunk back down to her regular size by Glum who has come back for her. Angel is relieved that things can start to return to normal but she is then informed that Rex Dexter appears to be dead. The duo flees from the scene before the police can arrive to arrest them for their parts in this death. Back during World War II, a young woman named Bette Turlife is held prisoner in the Lieberheim castle home of Dread Knight. Bette had fallen in love with the villain and announced that she was pregnant with his child. This revelation does not interest Dread Knight as he is searching for a means to grant him eternal life meaning that an heir would be redundant. SuperPatriot bursts into the castle to defeat Dread Knight and liberate his captive before she could be executed. He sends Bette to live in the United States where it is safer. Dragon leaps out of the hospital window in search of Angel and is informed by a nearby police officer that she had been shrunken down by a small red person. Dragon heads to the Chicago Police Department to enlist their help in locating Angel, now known to be in the custody of Glum. He is then called away from the precinct when a doctor calls to inform him that Jennifer has woken up. Jennifer is furious with her husband as his refusal to deal with any problem directly has led to this whole situation. Dragon suggests that they find a way to restore her with superhuman abilities but this merely serves to upset Jennifer more. In the wreckage of Dragon’s house, the police find a recovering SuperPatriot who is clearly disoriented. Rex Dexter’s corpse has somehow gone missing, leaving behind only the I-beam that had impaled him and a pool of blood as the only clue that he had been there. SuperPatriot is taken to Hillman Hospital where Ann Stevens treats him, warning the hero that his advancing aid is slowing him down. Battle Tank interrupts to recruit their help as the Nuclear Man has arrived in the United States and has already brushed aside the entire S.O.S. and is on a direct route towards the White House. SuperPatriot is uninterested in going to President Bush’s aid and refuses to help out. During the 1970s, Dread Knight had taken a marine hostage and revealed to him that he was his real father and not Philip Urass. This marine was in fact Ronald Winston Urass and he learns from his father that he is the heir to the Lierberheim throne but needs to be tested to see if he is worthy for the role as Dread Knight’s quest for immortality has failed and he is slowly dying. SuperPatriot arrives once more to foil his enemy’s plans and releases the prisoner. The media interviews Dragon over the fact that his election victory has been thrown out due to irregularities caused by the voting machines. Dragon believes that the whole election should be redone without the devices as the Republican Party’s victory seems shady too. 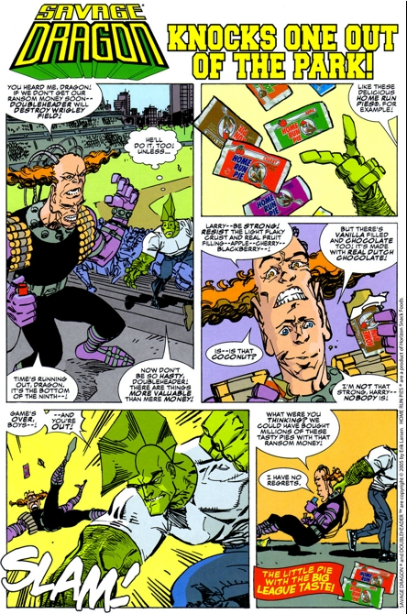 He then turns down the plea for help from his Liberty League teammates as they go to face Nuclear Man. Urass watches the television footage of Dragon and blames him for ruining his plans to gain a position in the White House, vowing that this matter is far from over. 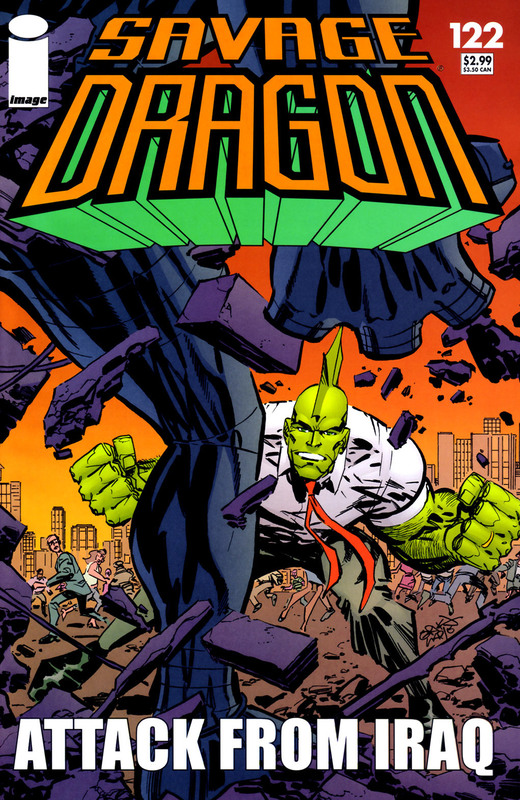 Savage Dragon Knocks One Out of the Park! DoubleHeader has planted explosives all around Wrigley Field and vows to blow up the part unless he is paid a large ransom demand. Dragon arrives on the scene and offers up something better than money, a variety of different Home Run Pies! DoubleHeader debates over what to do but ultimately one of the brains opts to start feeding these delicious pies which enables Dragon to easily defeat him. Dragon takes the villain into custody but DoubleHeader has no regrets.